Some of the contamination was found on workers' cars or pickups. At about 4 p.m., workers were in the process of being released from the offices as radiation surveys determined that there was a clean route for them to exit the administrative area without tracking and spreading contamination that might be on the ground. The contamination may be from the final demolition work Friday on the plant's most contaminated area, the Plutonium Reclamation Facility, said Ty Blackford, president of CH2M Hill Plateau Remediation Co., in a message to employees. The last of the reclamation facility was torn down Friday as part of demolition work that started 13 months ago. The reclamation facility was believed to be the most contaminated area of the plant. 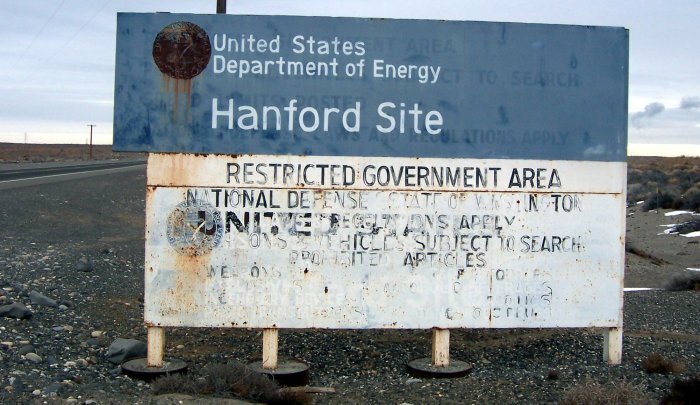 Hanford officials have called the plutonium and other radioactive particles there "flighty" because they can become airborne easily. Since Friday's open-air demolition using heavy equipment, small amounts of contamination have been found on a jersey barrier, a vehicle hood, the ground and a trash can near the Plutonium Finishing Plant's office trailer, according to Hanford officials. The specks of contamination on two workers' vehicles parked at the plant were discovered Monday. It is unknown if the vehicles were contaminated Monday or if they had been contaminated as long ago as Friday, driven home and then driven back to work. "The interiors of both vehicles were surveyed, and no contamination was detected inside either vehicle," Blackford said in a memo to employees late afternoon Monday. "Additional surveying is being considered." Work at the Plutonium Finishing Plant had been stopped Wednesday and Thursday with about a half day's demolition left on the reclamation facility. CH2M officials and union leaders were concerned about laboratory results for lapel air monitors worn by several plant workers who were south of the demolition area. They showed that workers possibly could have inhaled low levels of airborne radioactive contamination in recent days. Testing of workers for contamination within their bodies is continuing. The demolition zone was expanded before last week's stop-work order was lifted. When demolition work resumed Friday, the southern boundary of the demolition zone had been expanded and workers there were required to wear respirators. Routine radiological surveying was done after demolition work wrapped up Friday on the reclamation facility. Surveyors found specks of contamination to the east of the reclamation facility and what remains of the main processing area of the Plutonium Finishing Plant. A stop work order was issued by CH2M officials Sunday. Employees returned to work at the plant after the weekend Monday, but no demolition work was done. Surveys had shown the area near the offices to be clean, but more specks of contamination were found there Monday, which was a breezy day, during follow-up surveying. A critique was held Monday to discuss the contamination spread, its possible causes and the path forward, Blackford told employees. A spread of radioactive material also occurred in June. "Friday's contamination spread was smaller and at lower levels than the contamination spread in June," Blackford said. In June, as demolition was being done on the plant's reclamation facility, small spots of low-level radioactive contamination were found outside the area marked for radiological control near the demolition. An airborne radiation alarm also sounded and workers were ordered to take cover as a precaution. In August, Washington Department of Health laboratory results came back for air samples collected the same day as the June contamination spread. Samples collected at least three miles from the plant had radioactive contamination at such low levels that it was not considered a health risk. The only activities allowed under the current stop work order at the Plutonium Finishing Plant are stabilization of debris from the demolition of the reclamation facility to make sure rubble piles are safe and surveying for radioactive contamination spread. "As I said last week, PFP has and will continue to challenge us," Blackford told employees. "We will work through this and learn from it." Before the most recent stop-work order, Blackford had within a few weeks the remainder of the Plutonium Finishing Plant could be demolished down to its foundation. humans can not manage nukes of any kind sep energy! humans eat there babies! Just what is a "safe level" of plutonium contamination? Demonic/human alien hybrids say "kill the humans!" We LOVE radiation! Time bomb since I lived there in the early 80s. Alpha aint Beta, Gamma nor even Neutron. It ain't no reactor hazards! Please, NO COWBOYS! Oxides of this git mighty flighty, you can't see it wet, and real-time detection is tricky often misread as "radon."